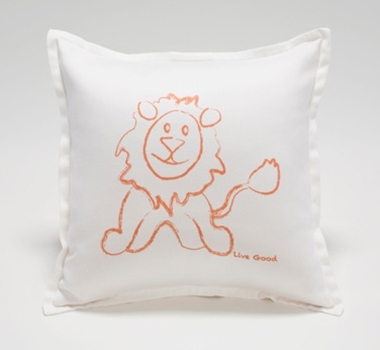 A sunny smile from this friendly lion warms up a bedroom or playroom. He represents the African lion that is now facing extinction. The image is screened onto organic white cotton sateen using water-based ink, and the back closure features soft fabric ties. Each pillow comes with an organic insert stuffed with organic fibers from the kapok tree. These inserts are moisture-resistant, quick-drying, lightweight, completely hypo-allergenic, mold resistant and odorless.